This entry was posted in Academic achievements and tagged Honors College on April 24, 2014 by Wire Eagle. AUBURN UNIVERSITY – Auburn University junior Sam Wilcox, an Honors College student majoring in history with a minor in economics, has been named a recipient of the Harry S. Truman Scholarship, one of the nation’s top academic awards bestowed to college juniors. Wilcox, a native of Nashville, Tenn., was informed of the prestigious award by Auburn University President Jay Gogue during a surprise visit to class. Created in 1975 by an act of Congress, the Harry S. Truman Scholarship is awarded to 59 college juniors on the basis of four criteria: service on campus and in the community, commitment to a career in public service, communication ability and aptitude to be a “change agent” and academic talent that would assure acceptance to a first-rate graduate school. Wilcox is a Student Government Association senator representing the College of Liberal Arts, member of the Committee of 19 hunger awareness group, supplemental instructor, legislative intern for Congressman Jim Cooper in the 5th District of Tennessee and a regional volunteer coordinator for Bama Covered, a health care volunteer group. At Auburn, he introduced legislation to add gender identity and gender expression to Auburn’s anti-discrimination policy and led efforts to make Auburn’s athletic arenas a more inclusive place for all students and guests. 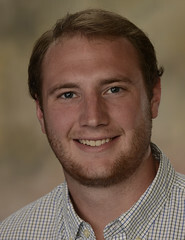 “Sam personifies the Honors College goal of excellence in academics and he is a model of Auburn’s land-grant mission of leadership and service to the state of Alabama. The Truman Scholarship recognizes Sam’s tremendous potential to create positive change in his state and his nation, and we are so pleased that Sam has been recognized by this award,” said Melissa Baumann, Auburn University assistant provost and Honors College director. Wilcox has also written editorials and guest columns on social and political issues, including a column on the effects of Tennessee’s voter ID law that ran in Nashville’s newspaper, The Tennessean. Harris also said that Wilcox received outstanding practice thanks to his interview committee, co-chaired by Paula Bobrowski, associate dean in the College of Liberal Arts, and Raj Chaudhury, associate director for the Biggio Center for the Enhancement of Teaching and Learning. As part of the award, Wilcox will receive up to $30,000 to apply toward graduate study in the U.S. or abroad in a wide variety of fields. To learn more about the scholarship, visit https://www.truman.gov/.